blogsters guild: STEVIE B: WHY DID GOD INVENT HIM? My dreams have been shattered, my life has changed.... for the love of God! 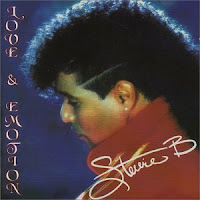 For 25 plus years I thought Stevie B was "gangster "prrrrt WRONG! This is the first time I've ever seen him "live". He looks like Little Richard gone wild (they probably did each other). I don't know when this clip was taken, probably yesterday as far as I'm concerned. I doubt he can part with his Jerry curl mullet and Michael Jackson's Billie Jean outfit. And what is that metal around his waist? Did he beat Hulk Hogan in the 80's for the WWF championship title? I guess the mysterious"B" stands for...well, a lot of creative words. All in all Stevie is still the man...but more of a girly man now. Enjoy the videos and see what I'm talking about!! If you liked this post please Stumble or Digg it!